The Buffalo Sabres will attempt to reel in the fish the Nashville Predators could not: prized prospect Jimmy Vesey. Buffalo acquired the rights to the pending unrestricted free agent on Monday, five days before the entry draft opens in their town, in exchange for Minnesota’s third-round pick (76th overall) on Saturday. Vesey, 23, is under no obligation to sign with the Sabres. He can choose to negotiate with Buffalo or sign with any of the NHL’s other 27 teams beginning on Aug. 15. A third-round pick of the Predators in 2012 at 66th overall, Vesey informed Nashville in late March that he would exercise his right to free agency in August. The Sabres will now have a head start on the rest of the league. The risk was minimal. As Murray pointed out to TSN Hockey Insider Bob McKenzie, the Sabres owned multiple third-round picks in this draft. Buffalo did not negotiate with Vesey’s camp prior to pulling the trigger on the trade. Vesey raised eyebrows when he turned down a guaranteed spot in Nashville’s top two lines and an instant role in the 2016 Stanley Cup playoffs just days after his senior season ended at Harvard University. Normally reserved Predators GM David Poile called it a “bizarre situation,” saying he was blocked access to Vesey by his agents. Vesey is represented by Peter Fish of Global Hockey Consultants, the same group that represents Sabres forward Jack Eichel. Though the Predators were able to recoup the third-round pick they spent on Vesey, they will not recover the hours and dollars spent monitoring and fostering his development. 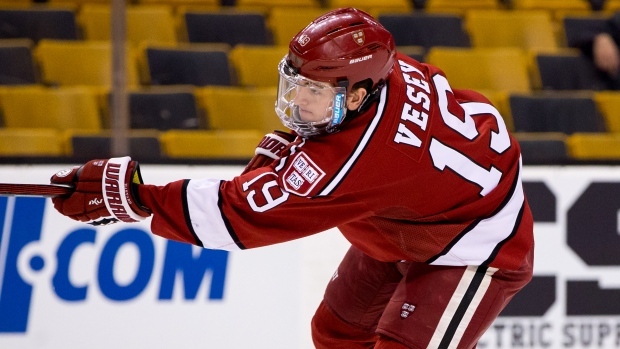 Vesey will not gain any financial leverage by waiting until Aug. 15. He will be locked into a two-year entry-level deal with a maximum salary of $925,000 - the same as any team can offer - wherever he signs. He could earn an additional $2.85 million per season in attainable performance-based bonuses, but again, that figure would likely be matched anywhere. For Vesey, the discussion always seemed to be more about fit. Vesey will have a lot of reconnaissance to sift through from Eichel. He will receive the full sales pitch from Murray and Sabres owner Terry Pegula. But Buffalo will not be alone. If there are any doubts about Buffalo, the hockey world can be Vesey’s oyster in fewer than 60 days. To be sure, if Vesey still makes it to market, other NHL teams will line up to try and sign him. The 6-foot-1 left winger finished his college career with 80 goals and 64 assists for 144 points in 128 games. He won the Hobey Baker Award as the top player in men's NCAA hockey this past season. The Toronto Maple Leafs were rumoured to be jockeying for position in the Vesey Sweepstakes last summer when they hired his father, Jim, as an amateur scout. They also drafted Vesey’s younger brother, Nolan, in the sixth round in 2014. Vesey's hometown Bruins were also believed to be a favourite. He grew up in North Reading, Mass., less than 30 minutes from TD Garden. His father, Jim, played four games for the Bruins in 1991-92, just before he was born - and current Bruins GM Don Sweeney also starred for four years at Harvard. They will all have to wait. The Sabres get the first crack.